MAKE EVERY DAY MANDELA DAY – HAPPY 95TH BIRTHDAY MR. MANDELA!! one of the most beloved humanitarians of all time. We invite YOU to participate in this global Mandela Day Celebration. The objective of Mandela Day is to inspire individuals to take action to help change the world for the better and to build a global movement for good by giving 67 minutes of your time in service, to commemorate the 67 years of service Mr. Mandela gave of his life for humanity. Ultimately it seeks to empower communities everywhere. Honor the life and legacy of Nelson Mandela by making your “Mandela deed” part of history. 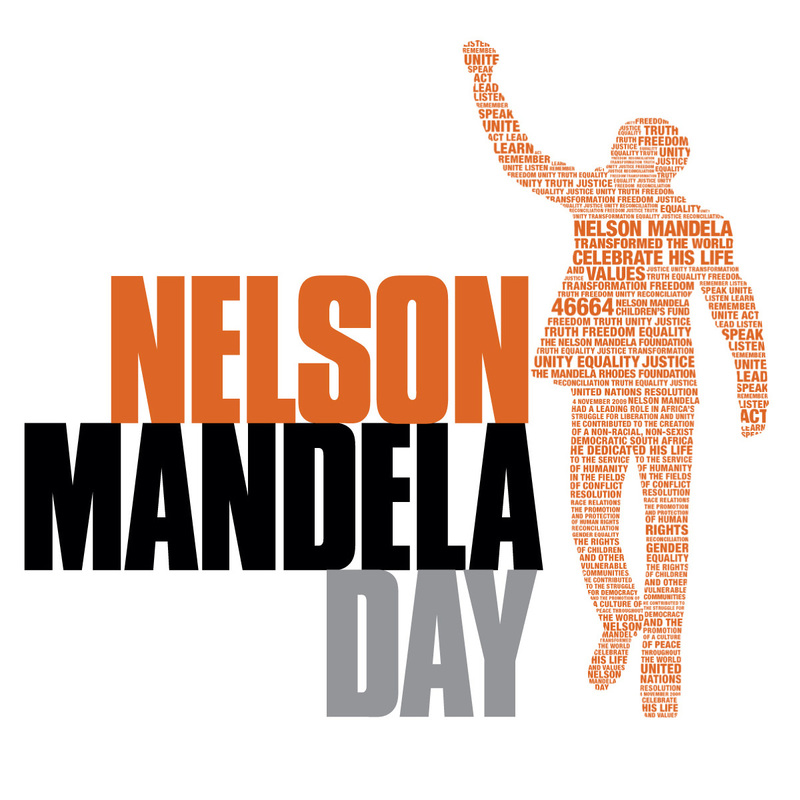 Visit the Mandela Day Activities to pledge your support and let us know how you plan to commemorate the day. Then document your act of kindness on Mandela Day and share it with the world. You can send your feedback, pictures and experiences to nmf@nelsonmandela.org. Mandela Day is a celebration of our collective power to do good and make a positive imprint on the world. You can add to the initiative’s momentum by forwarding this email or telling as many people as possible about it. Use your own network of friends, media connections, corporate partners and organizations to get involved and make a difference. 1. Make a new friend. Get to know someone from a different cultural background. Only through mutual understanding can we rid our communities of intolerance and xenophobia. 2. Read to someone who can’t. Visit a local home for the blind and open up a new world for someone else. 3. Fix the potholes in your street or neighborhood. 4. Help out at the local animal shelter. Dogs without homes still need a walk and a bit of love. 5. Find out from your local library if it has a story hour and offer to read during it. 6. Offer to take an elderly neighbor who can’t drive to do their shopping/chores. 7. Organize a litter cleanup day in your area. 8. Get a group of people to each knit a square and make a blanket for someone in need. 9. Volunteer at your police station or local faith-based organization. 11. If you’re a builder, help build or improve someone’s home. 12. Help someone to get his/her business off the ground. 13. Build a website for someone who needs one, or for a cause you think needs the support. 14. Help someone get a job. Put together and print a CV for them, or help them with their interview skills. 15. If you’re a lawyer, do some pro-bono work for a worthwhile cause or person. 16. Write to your city council about a problem in the area that requires attention, which you, in your personal capacity, are unable to attend to. 17. Sponsor a group of learners to go to the theater/zoo. 18. Get in touch with your local HIV organizations and find out how you can help. 19. Help out at your local hospice, as staff members often need as much support as the patients. 20. Many terminally ill people have no one to speak to. Take a little time to have a chat and bring some sunshine into their lives. 21. Talk to your friends and family about HIV. 22. Get tested for HIV and encourage your partner to do so too. 23. Take a bag full of toys to a local hospital that has a children’s ward. 24. Take younger members of your family for a walk in the park. 25. Donate some medical supplies to a local community clinic. 26. Take someone you know, who can’t afford it, to get their eyes tested or their teeth checked. 27. Bake something for a support group of your choice. 28. Start a community garden to encourage healthy eating in your community. 29. Donate a wheelchair or guide dog, to someone in need. 30. Create a food parcel and give it to someone in need. 31. Offer to help out at your local school. 32. Mentor a school leaver or student in your field of expertise. 33. Coach one of the extramural activities the school offers. You can also volunteer to coach an extramural activity the school doesn’t offer. 34. Offer to provide tutoring in a school subject you are good at. 35. Donate your old computer. 36. Help maintain the sports fields. 37. Fix up a classroom by replacing broken windows, doors and light bulbs. 38. Donate a bag of art supplies. 39. Teach an adult literacy class. 40. Paint classrooms and school buildings. 41. Donate your old textbooks, or any other good books, to a school library. 42. Buy a few blankets, or grab the ones you no longer need from home and give them to someone in need. 43. Clean out your cupboard and donate the clothes you no longer wear to someone who needs them. 44. Put together food parcels for a needy family. 45. Organize a bake sale, car wash or garage sale for charity and donate the proceeds. 46. To the poorest of the poor, shoes can be a luxury. Don’t hoard them if you don’t wear them. Pass them on! 47. Volunteer at your local soup kitchen. 48. Help at a local children’s home or orphanage. 49. Help the kids with their studies. 50. Organize a friendly game of soccer, or sponsor the kids to watch a game at the local stadium. 51. Coach a sports team and make new friends. 52. Donate sporting equipment to a children’s shelter. 53. Donate educational toys and books to a children’s home. 54. Paint, or repair, infrastructure at an orphanage or youth center. 55. Mentor someone. Make time to listen to what the kids have to say and give them good advice. 56. If you play an instrument, visit your local old-age home and spend an hour playing for the residents and staff. 57. Learn the story of someone older than you. Too often people forget that the elderly have a wealth of experience and wisdom and, more often than not, an interesting story to tell. 58. Take an elderly person grocery shopping; they will appreciate your company and assistance. 59. Take someone’s dog for a walk if they are too frail to do so themselves. 60. Mow someone’s lawn and help them to fix things around their house. 61. If there are no recycling centers in your area, petition your area city council to provide one. 62. Donate indigenous trees to beautify neighborhoods in poorer areas. 63. Collect old newspapers from a school/community center/hospital and take them to a recycling center. 64. Identify open manhole covers or drains in your area and report them to the local authorities. 65. Organize the company/school/organization that you work with to switch off all unnecessary lights and power supplies at night and on weekends. 66. Engage with people who litter and see if you can convince them of the value of clean surroundings. 67. Organize to clean up your local park, river, beach, street, town square or sports grounds with a few friends. Our children deserve to grow up in a clean and healthy environment. A Proud Supporter of the Mandela Day Campaign.